Objective: The objective of the study is to evaluate levels of chemokine (C-C motif) ligand 18 (CCL18) in human glioma tissues and effects of CCL18 on U251 glioma cells. Materials and Methods: By using the real-time reverse transcription polymerase chain reaction and immunochemically histological staining, we determined the mRNA and protein levels of CCL18 in tissues of 60 patients with World Health Organization (WHO) Grades II, III and IV glioma and the normal brain. Cultured U251 glioma cells were incubated with CCL18 and then subjected to transwell. The scratch wound-healing and cell count kit (CCK-8) assays were performed to detect the possible effects of CCL18 on the cell invasion, migration, and proliferation. Results: In the tissues of the normal brain (n = 10), glioma Grade II (n = 26), III (n = 18), and IV (n = 16), CCL18 mRNA expression levels were 1.00 ± 0.09, 6.02 ± 1.26, 26.35 ± 3.98, and 112.21 ± 13.25 fold, respectively (P < 0.01); the percentage of CCL18-positive glioma cells was 0%, 58.8%, 70.0%, and 100% in the normal brain, glioma WHO Grade II, III, and IV, respectively (P < 0.01). Different concentrations of CCL18 (0, 5, and 10 ng/ml) enhanced the of U251 glioma cell invasion in 24 h transwell assays [from 43.5 ± 8.3 to 202.0 ± 18.5 and 279.7 ± 18.6 cells (P < 0.01)], increased the cell migration quantified by comparing the areas of the scratch (pixel) [at 12 h, 498.4 ± 75.3, 381.3 ± 21.4, and 347.7 ± 14.2; at 24 h, 299.5 ± 15.3, 284.6 ± 7.8, and 237.3 ± 20.6 (P < 0.05)], and significantly increased the cell growth in CCK-8 assay [from 1.000 ± 0.019–1.260 ± 0.094 and 2.070 ± 0.138 fold in CCL18, respectively (n = 20/each group) (P < 0.01)]. Conclusion: We have found that CCL18 is highly expressed in glioma tissues and enhances the invasion, migration, and proliferation of U251 glioma cells. Therefore, CCL18 may be a potential biomarker for detecting and grading human glioma. Chemokine (C-C motif) ligand 18 (CCL18) is a small cytokine belonging to the CC chemokine family, in which chemotactic cytokines act through seven-transmembrane domain G protein-coupled receptors on their target cells and play roles in various biological and pathological processes, such as migration of leukocytes, angiogenesis, and tumor growth. CCL18 levels markedly increase in different cancers, such as ovarian, breast, colorectal, gastric, lung,, and bladder cancers, but the data about the role of CCL18 in human glioma are limited. The increasing evidence has been shown that CCL18 may be involved in the development of various cancers. For instance, CCL18 promoted the angiogenesis in breast cancer, the migration in ovarian cancer, the invasion in pancreatic cancer, and the malignant progression of prostate cancer. Recent studies have shown that CCL18 released by glycosylated extracellular vesicles of glioblastoma cells is involved in a triple interaction between the chemokine receptor CCR8 on glioblastoma cells and stimulates tumor-associated macrophages., In addition, CCL18 may be a potential candidate of an important marker for detecting different types of human cancers, such as bladder, breast,, and gastric cancers. The aim of this study is to investigate the possible association of CCL18 with human glioma and the functions of CCL18 on glioma cells. We have measured the expression levels of CCL18 in human glioma tissues and observed the effects of the recombinant CCL18 on cultured glioblastoma cells. We have further confirmed the high levels of CCL18 expression in glioma and the promotion effects of CCL18 on glioma cells. This study was approved by the ethics committee of Surgery of Bingzhou Medical College, Shandong Province, China. Informed consent was obtained from all patients. Brain specimens were obtained from 60 patients hospitalized in the Department of Neurology from January 2012 to December 2016, which were histopathologically diagnosed as glioma by the Department of Pathology [Table 1]. The relative normal brain tissues (n = 10) were from postmortem biopsies of preterm babies. For each specimen, the half tissue was frozen at −80°C and another half was paraffin embedded and cut into sections at 4 μm thickness. Total RNA was extracted from frozen tissue specimens using Trizol reagents (Life Technologies, Carlsbad, CA, USA) according to the manufacturer's protocol and subjected to reverse transcription polymerase chain reaction (RT-PCR) with CCL18 primers (forward: 5'-CCG CCT CGT CTA TAC CTC C-3' and reverse: 5'-CAC TTC TTA TTG GGG TCA GC-3') and the endogenous reference control gene β-actin primers (forward: 5'-CCA ACT GGG ACG ACA T-3' and reverse: 5'-TCT GGG TCA TCT TCT CG-3') (TAKARA, Takara Bio., Mountain View, CA, USA). Real-time Reverse transcription polymerase chain reaction (RT-PCR) was performed with iTaq Universal SYBR Green One-Step Kit (Bio-Rad, Hercules, CA, USA) in a C1000 Thermal Cycler (Bio-Rad). Cycle conditions for all PCRs were as follows: 50°C, 30 min for RT and then an initial incubation of 3 min at 95°C followed by 40 cycles at 95°C 10 s, 60°C 20 s. The 2−ΔΔCt method was used to calculate the relative levels of specific mRNA. Brain tissue sections at 4 μm thickness were cut from paraffin-embedded samples. Slides were deparaffinized in xylene and transferred through two changes of 100% ethanol before washing with distilled water. The rehydrated sections were treated with 3% hydrogen peroxide for 10 min for inactivation of the endogenous peroxidases. Between the following steps, the sections were washed with PBS three times. The sections were autoclaved in retrieval solution (0.01 M citrate buffer, pH 6.0) and then cooled at room temperature for 15 min. Sections were incubated with the primary antibody, rabbit anti-human CCL18 antibody (1:100) (Abcam, USA), at 4°C overnight. Routine negative controls using Phosphate Buffered Saline (PBS) instead of the primary antibody were included to verify specificity. The diagnosed glioma sections were used as positive controls. The bound primary antibody was detected by incubation with Biotinylated Goat Anti-Rabbit IgG (Vector Laboratories, Burlingame, CA, USA) (1:100) at 37°C for 30 min, and then developed with 3,3'-diaminobenzidine. The specimens were counterstained with hematoxylin, mounted, and examined by light microscopy (Olympus I × 71, Olympus Optical Co. Ltd, Tokyo, Japan). Immunohistochemical staining criteria were based on the positive cell percentage scoring: positive cells <5% for 0 points, 5% to 25% for 1 point, 26% to 50% for 2 points, >50% for 3 points; and the intensity of coloring: no color for 0 points, light yellow for 1 point, brown or brownish yellow for 2 points. Two scores were added to the final score for immunohistochemical staining and graded according to the following criteria: 0 point for negative (−), 1–2 points for weak positive (+), 3–4 pints for moderate positive (++), and 5 points for strong positive (+++); all +, ++ and +++ for positive. Transwell invasion assays were performed to determine the effects of CCL18 on invasion of U251 glioma cells. The human glioblastoma cell line U251 was purchased from Shanghai Cell Bank, Type Culture Collection Committee, Chinese Academy of Sciences. Cells were cultured in Dulbecco's modified Eagle's medium and F-12 (DMEM/F-12) (Invitrogen, Carlsbad, CA, USA), supplemented with 10% fetal bovine serum and grown in a humidified incubator with 5% CO2 at 37°C. U251 cells (1 × 104 cells/well) were seeded into the upper chamber of a polycarbonate transwell plate (8 μm pores size; Corning, USA) in 300 μl of a serum-free medium. The bottom chamber contained 500 μl of serum-free medium and human recombinant CCL18 (PeproTech, Rocky Hill, NJ, USA) (0, 5, or 10 ng/ml). The plate was incubated for 24 h and noninvading cells were removed from the upper surface of the filter with a cotton swab. Invasive cells with the ability to go through the membrane and grow on the lower surface were fixed with ice-cold methanol for 10 min, and then stained with a 0.5% crystal violet, 20% (v/v) hematoxylin solution in ethanol for 15 min. After several washes with PBS, membranes were dry before being mounted on a glass slide. Cells were photographed and counted in 10 random fields at ×100 magnification. A scratch wound-healing assay was performed to evaluate the migration ability of glioblastoma U251 cells. Cells in serum-free DMEM/F-12 medium were seeded into a 24-well plate until confluence is reached. One day after plating, a scratch was made using a 200 μl pipette tip. The cells were incubated for 24 h in serum-free medium. Pictures were taken at 12 and 24 h after the scratch was made. To quantify the migration of U251 glioma cells, the total pixel area that was unoccupied by cells was calculated with NIH image software (NIH, Bethesda, MD, USA). The average of three values for each treatment was compared. CCL18-treated and untreated cells were seeded at a density of 5 × 103 cells per well in a 96-well plate. Cell proliferation was detected by using the Cell Count Kit-8 (CCK-8) (Sigma-Aldrich, St. Louis, MO, USA) according to the manufacturer's instructions. At 24 h, CCK8 solution was added to each well and incubated for 1 h. Absorbance was detected at a wavelength of 450 nm by a microplate reader (BioRad). Three wells were measured for cell viability in each treatment group, and all independent treatments were performed in triplicate. Statistical analysis was done by ANOVA analysis and ANOVA posttest. Differences with P < 0.05 were considered as statistically significant and P < 0.01 as very significant. Our primary goals were to investigate the possible roles of CCL18 in human glioma. Therefore, we determined the mRNA expression levels of CCL18 by real-time RT-PCR in gliomas with grading severities. While the level in the normal brain tissues was set as 1 ± 0.09 fold (n = 10), the CCL18 mRNA expression levels were dramatically increased in glioma WHO grade II, 6.02 ± 1.26 fold (n = 26), III, 26.35 ± 3.98 fold (n = 18), and IV, 112.21 ± 13.25 fold (n = 16), respectively. ANOVA analysis showed P < 0.01, with very significant differences between 4 groups. ANOVA posttest further displayed the significant difference between each of two groups [Figure 1]a. The data suggest that CCL18 elevates in the development of glioma. By immunohistochemical staining with anti-CCL18 antibody, we observed the brown-stained particles in the nuclei and or cytosol in CCL18-positive cells. Under microscope (magnification ×400), 5 fields of each section were randomly selected and 500–1,000 cells were counted for calculation of the CCL18-positive cell ratio. No CCL18-positive cells were observed in any sections of the normal brain tissues (0/10, 0%), but CCL18-positive cells were observed in all sections of different WHO grades of glioma: Grade II, 26/26 (100%); III, 18/18 (100%); and IV, 16/16 (100%), respectively (P < 0.01) [Figure 1]b. By cell counting, there were 0% of the CCL18-positive cells in the normal brain tissues (n = 10), but 53.5 ± 4.9%, 66.7 ± 7.6%, and 75.0 ± 6.3% in glioma WHO Grade II (n = 26), III (n = 18), and IV (n = 16), respectively [Table 2]. ANOVA analysis showed P < 0.01, with very significant differences between four groups. 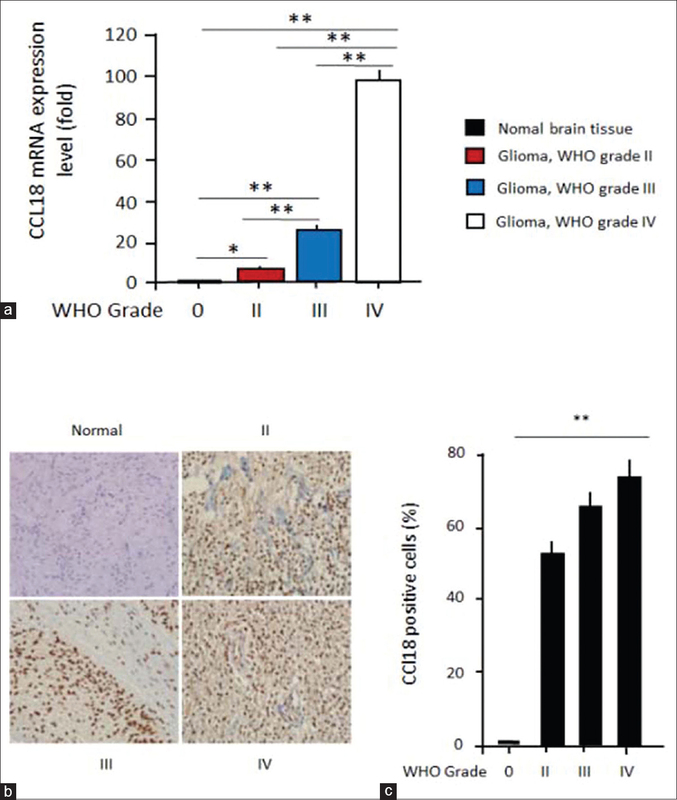 ANOVA posttest further displayed the significant difference between each of two groups [Figure 1]c. The data suggest that increasing percentage of CCL18 presents in all grades of glioma tissues, but not in the normal brain tissues. We further measured the possible effects of CCL18 on the invasion of glioblastoma U251cell line. Transwell assays revealed that CCL18 dose-dependently increased the invasion of U251 cells. CCL18-promoted cells invading through the Matrigel were stained and counted under microscope [Figure 2]a. Quantitative results for the transmembrane cells of each group (n = 5) were 43.5 ± 8.3, 202.0 ± 18.5, and 279.7 ± 18.6, at the CCL18 concentration 0, 5, and 10 ng/ml, respectively. There were very significant differences between four groups (P < 0.01) determined by ANOVA analysis and very significant difference between each two groups by ANOVA posttest (P < 0.01) [Figure 2]a. The scratch wound-healing assay revealed that the movement of U251 glioma cells was affected by CCL18 depending on its concentrations and incubation time periods. Cell migration was assessed by the wound-healing assay following treatment with CCL18. The migration of cells was visually monitored with micrographs taken at 12 and 24 h. Representative micrographs of U251 glioma cells treated with CCL18 at the concentration of 0, 5, or 10 ng/ml or 24 h are shown in [Figure 2]b. The cell migration was quantified by comparing the areas of the scratch (pixel): at 12 h, 498.4 ± 75.3, 381.3 ± 21.4, and 347.7 ± 14.2 at the CCL18 concentration of 0, 5 or 10 ng/ml, respectively; at 24 h, 299.5 ± 15.3, 284.6 ± 7.8, and 237.3 ± 20.6 at the CCL18 concentration of 0, 5 or 10 ng/ml, respectively. There were significant differences between three groups (P < 0.05) determined by ANOVA analysis [Figure 2]b. We further examined the possible effects of CCL18 on the proliferation of glioma cells by using CCK-8 assay. By comparing with nonCCL18-treated cells, the cell growth was significantly increased from 1.000 ± 0.019 (no CCL18) to 1.260 ± 0.094 and 2.070 ± 0.138fold in CCL18 (5 and 10 ng/ml) treated cells at 24 h, respectively. There were very significant differences between three groups (P < 0.01) determined by ANOVA analysis, and very significant difference between each two groups by ANOVA posttest (P < 0.01) [Figure 2]c. These results suggest the proliferation-promoting role of CCL18 in glioma cells. In the present study, we have confirmed the correlation of CCL18 with human glioma. In 60 glioma and 10 normal brain samples, we have found that the CCL18 mRNA expression levels or CCL18-positive cells significantly increase in glioma tissues depending on the WHO grades, indicating that the levels of CCL18 correlate with the glioma severities. Incubation of U251 glioblastoma cells with the recombinant CCL18, we have observed the significant increase in the invasion, migration, and proliferation of cells in the dose-depending pattern. Our findings have evidenced the presence of CCL18 in human glioma tissues while no CCL18 in normal brains. We have also found the promoting functions of CCL18 on glioma cells. Molecular biomarkers have been reported to predict tumor outcome. In the field of glioma, the important genetic markers include mutations in genes of isocitrate dehydrogenase, the telomerase reverse transcriptase promoter, and co-deletion of chromosome arms 1p and 19q., Although very few of them have been used in clinical practice, some potential candidate molecules have been studied as brain tumor biomarkers, such as vascular endothelial growth factor, platelet-derived growth factor, and follistatin.,,, CCL18 is a chemotactic cytokine that is expressed by a broad range of lymphocytes and plays an important role in inflammation and generation of the immune response. Previous reports showed that CCL18 was involved in the pathogenesis and progression of various disorders, including cancer. However, the role of CCL18 in cancers seems to depend on tumor types.,,,,,,,,, For instance, CCL18 mRNA and protein were reportedly expressed at higher levels in breast cancer. Interestingly, we have observed that the CCL18 expression at transcriptional and translational levels dramatically elevate in glioma tissues but are undetectable in normal brain, indicating that CCL18 might be a potential candidate of biomarker for detecting and prognosis predicting of glioma. 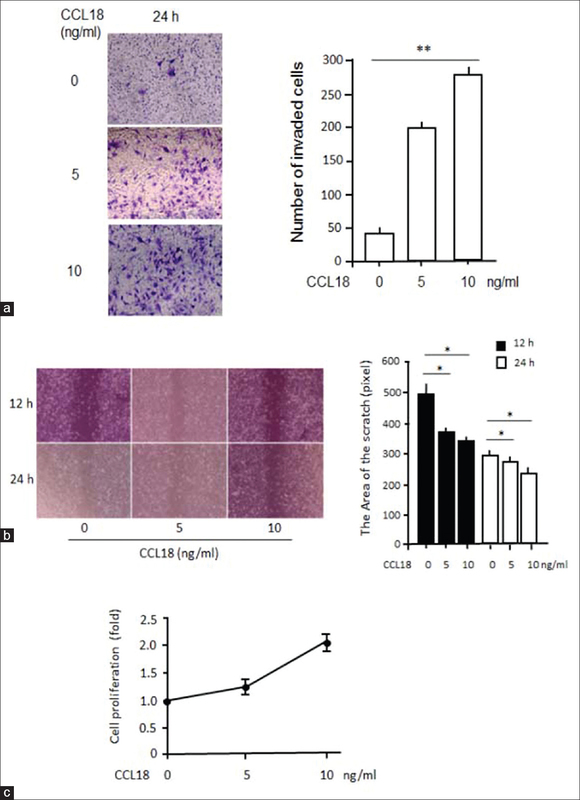 CCL18 is first identified as a chemoattractant for naïve T cells and is one of the most highly expressed chemokines in human chronic inflammatory diseases. Several pieces of the evidence support the notion that CCL18 functions in the cancer initiation and progression. The levels of CCL18 correlate with the degree of malignancy in prostate cancer, breast cancer, nonsmall cell lung cancer, bladder cancer, gastric cancer, and ovarian cancer. After incubation of U251 glioma cells with different concentrations of recombinant CCL18 for different time periods, we have found that CCL18 stimulated the invasion, migration, and proliferation of glioma cells, indicating that CCL18 might promote the progression of glioma. Therefore, CCL18 might be a novel target for treatment of glioma. CCL18 is highly expressed in glioma tissues and enhances the invasion, migration, and proliferation of U251 glioblastoma cell. Therefore, CCL18 might be a potential biomarker for detecting and grading human glioma, as well as a target for glioma treatment. This study was supported by Shandong Science and Technology Program (Grant No.J13LL07), China. Lenting K, Verhaak R, Ter Laan M, Wesseling P, Leenders W. Glioma: Experimental models and reality. Acta Neuropathol 2017;133:263-82. Ichimura K, Narita Y, Hawkins CE. Diffusely infiltrating astrocytomas: Pathology, molecular mechanisms and markers. Acta Neuropathol 2015;129:789-808. Wesseling P, van den Bent M, Perry A. Oligodendroglioma: Pathology, molecular mechanisms and markers. Acta Neuropathol 2015;129:809-27. Salazar N, Castellan M, Shirodkar SS, Lokeshwar BL. Chemokines and chemokine receptors as promoters of prostate cancer growth and progression. Crit Rev Eukaryot Gene Expr 2013;23:77-91. Lane D, Matte I, Laplante C, Garde-Granger P, Carignan A, Bessette P, et al. CCL18 from ascites promotes ovarian cancer cell migration through proline-rich tyrosine kinase 2 signaling. Mol Cancer 2016;15:58. Nariţa D, Seclaman E, Ursoniu S, Ilina R, Cireap N, Anghel A, et al. Expression of CCL18 and interleukin-6 in the plasma of breast cancer patients as compared with benign tumor patients and healthy controls. Rom J Morphol Embryol 2011;52:1261-7. Wu J, Liu X, Wang Y. Predictive value of preoperative serum CCL2, CCL18, and VEGF for the patients with gastric cancer. BMC Clin Pathol 2013;13:15. Shi L, Zhang B, Sun X, Zhang X, Lv S, Li H, et al. CC chemokine ligand 18(CCL18) promotes migration and invasion of lung cancer cells by binding to nir1 through nir1-ELMO1/DOC180 signaling pathway. Mol Carcinog 2016;55:2051-62. Zhong L, Luo H, Xu M. Expression and clinical significance of bFGF and CCL18 in non-small cell lung cancer. Int J Clin Exp Med 2016;9:8490-7. Urquidi V, Kim J, Chang M, Dai Y, Rosser CJ, Goodison S, et al. CCL18 in a multiplex urine-based assay for the detection of bladder cancer. PLoS One 2012;7:e37797. Lin L, Chen YS, Yao YD, Chen JQ, Chen JN, Huang SY, et al. CCL18 from tumor-associated macrophages promotes angiogenesis in breast cancer. Oncotarget 2015;6:34758-73. Meng F, Li W, Li C, Gao Z, Guo K, Song S, et al. CCL18 promotes epithelial-mesenchymal transition, invasion and migration of pancreatic cancer cells in pancreatic ductal adenocarcinoma. Int J Oncol 2015;46:1109-20. Chen G, Liang YX, Zhu JG, Fu X, Chen YF, Mo RJ, et al. CC chemokine ligand 18 correlates with malignant progression of prostate cancer. Biomed Res Int 2014;2014:230183. Berenguer J, Lagerweij T, Zhao XW, Dusoswa S, van der Stoop P, Westerman B, et al. Glycosylated extracellular vesicles released by glioblastoma cells are decorated by CCL18 allowing for cellular uptake via chemokine receptor CCR8. J Extracell Vesicles 2018;7:1446660. Zhu C, Chrifi I, Mustafa D, van der Weiden M, Leenen PJ, Duncker DJ, et al. CECR1-mediated cross talk between macrophages and vascular mural cells promotes neovascularization in malignant glioma. Oncogene 2017;36:5356-68. Chen J, Yao Y, Gong C, Yu F, Su S, Chen J, et al. CCL18 from tumor-associated macrophages promotes breast cancer metastasis via PITPNM3. Cancer Cell 2011;19:541-55. Li J, Guan HY, Gong LY, Song LB, Zhang N, Wu J, et al. Clinical significance of sphingosine kinase-1 expression in human astrocytomas progression and overall patient survival. Clin Cancer Res 2008;14:6996-7003. Ellison DW. 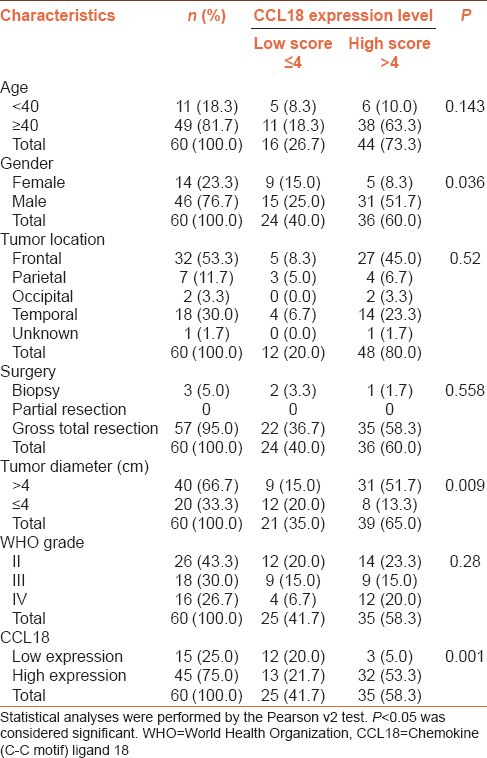 Multiple molecular data sets and the classification of adult diffuse gliomas. N Engl J Med 2015;372:2555-7. Eckel-Passow JE, Lachance DH, Molinaro AM, Walsh KM, Decker PA, Sicotte H, et al. Glioma groups based on 1p/19q, IDH, and TERT promoter mutations in tumors. N Engl J Med 2015;372:2499-508. McNamara MG, Sahebjam S, Mason WP. Emerging biomarkers in glioblastoma. Cancers (Basel) 2013;5:1103-19. Lekka ET, Ashton KN, Abel P, Davies C, Abel P, Davies C, et al. Follistatin, a novel biomarker formalignant gliomas. Neurosci Med 2015;6:121-9. Adema GJ, Hartgers F, Verstraten R, de Vries E, Marland G, Menon S, et al. Adendritic-cell-derived C-C chemokine that preferentially attracts naive T cells. Nature 1997;387:713-7.